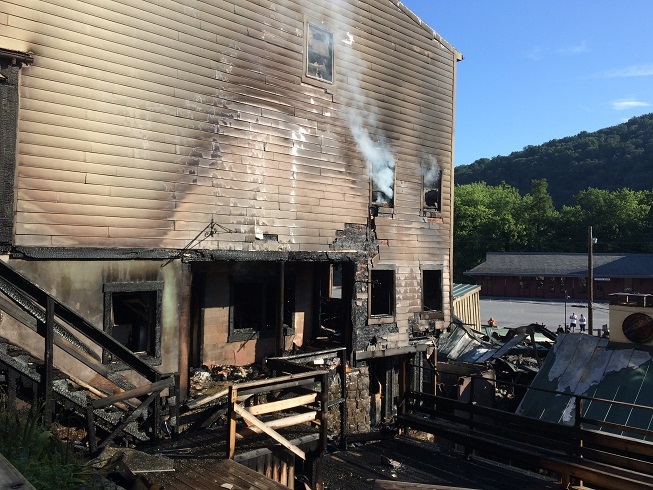 WASHINGTON — After a fire tore through businesses in the historic town of Harpers Ferry, W.Va., officials plan to ask for federal aid to help with the cost of rebuilding the damaged areas. “We are so small, to us it’s a devastation,” says Harpers Ferry Mayor Gregory Vaughn. The fire tore through three buildings and a shed Thursday morning, wiping out a significant chunk of the town’s commercial district. Two apartments and eight businesses are a total loss. Another business was damaged. Officials are still calculating the total cost of the three-alarm fire. Vaughn spent Thursday afternoon consoling business owners and other distraught residents as they surveyed the smoldering remains of their properties. “It was a tough situation confronting them under those circumstances,” Vaughn says. West Virginia state fire marshals brought in search dogs to comb through the scene, looking for an accelerant. The fire marshal’s office is still investigating the cause. The commercial area is adjacent to Harpers Ferry National Historic Park. Harpers Ferry was the site of a failed raid on a federal arsenal in 1858 by abolitionist John Brown. During the Civil War, Harpers Ferry changed hands eight times between 1861 and 1865.